29.04.2019, 11:03 через 7 Дней 0 Часов 23 мин. 4 сек. 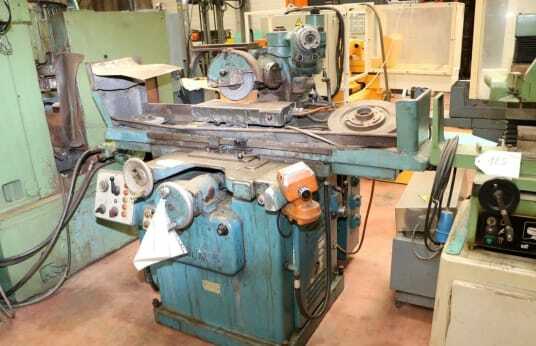 Flat grinding machine with tangential and rectangular grinding wheel, Longitudinal travel of the table 500mm, Transverse travel of the table 200mm, Surface of the table 600x200mm, Maximum height between the table and the grinding wheel axis: 400mm - Longitudinal feed speed of the table: 1 to 20m/min - Automatic transverse feed: 0.2 to 8mm/stroke - Automatic vertical feed: 0.001 to 0.01mm/stroke - Wheel diameter: 225mm - Wheel speeds: 1000 to 4000 rpm - Spindle motor: 3cv - Hydraulic power unit motor: 2cv, Stock number 93760. ATTENTION: Machine loaded by overhead crane.